Pin Money: "Puttin' on the Ritz"
Dressing fashionable and feeling fabulous go hand in hand. However, dressing fashionable and feeling fabulous do not equal spending a fortune. When shopping for clothing for yourself do not feel as though you need to "keep up with the Jones's." Fashion is so amazing because it allows us to let loose, show and explore who we are, and look and feel beautiful. Fashion is also about trial and error and sometimes it works and sometimes it just doesnt work. I agree with spending money on staples such as a little black dress, black pumps, a business suite, or a beautiful bag. However, when it comes to the fun, everyday toss-up-your style items, you should not be spending a fortune. Fashion is about fun not stress. Do not let buying a new jacket or top stress you out because of the price. It's all about finding the RIGHT items at the RIGHT prices. This will give you the financial freedom to experiment with all different types of clothing options to toss up your everyday staples. This crop shimmer jacket by Forever 21 for $29.80 is a rich twist to dark skinny jeans or black pants for the office. Pair with gold jewelery and you are set! 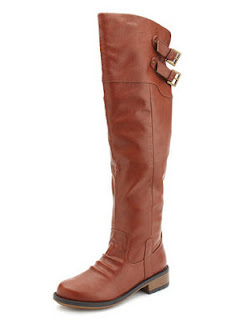 Flat riding boots are a must. They add style to any weekend outfit with skinny jeans, or with a sweater dress and tights for the office. Check out this great pair at Charolette Russe for $50.00. This sweater dress from Target comes in Jewel tone colors including a black and white striped option. 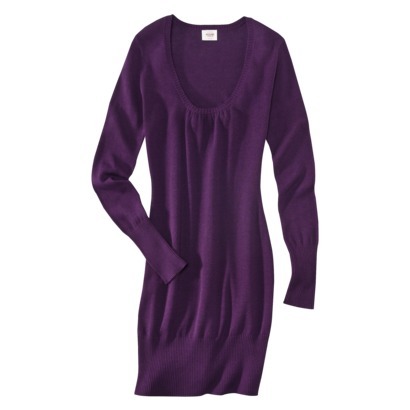 At $24.99 this sweater dress is a must for a casual day at the office with boots or for going out paired with leopard pumps. This faux leather caramel skirt by H&M is the perfect skirt to transition from the office to a night out on the town. Pair with tie up ankle boots or navy pumps for a kick. I want it all! Going shopping this weekend. You have a great eye girl! Lauren! What a great blog! 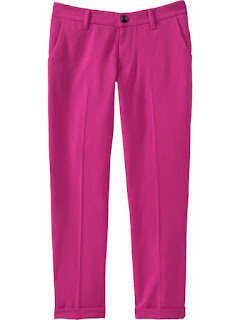 After drooling over those pink Old Navy ankle pants I was compelled to check them out online and... they are on sale! $18.00 for beautiful pants :) Looking forward to reading the next edition!